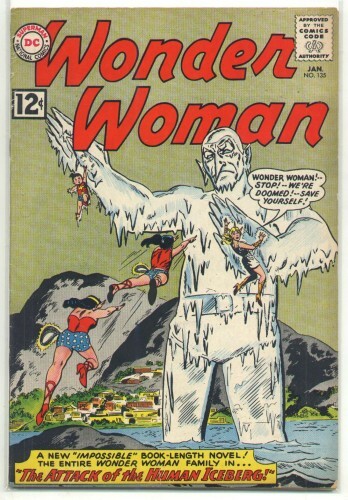 "Attack of the Human Iceberg"
Featuring Wonder Girl and Wonder Tot! VG : price penciled on back cover, 1/4" triangle out bottom right, tiny chip out bottom edge & top right, some abrasion at top spine, moderate handling & spine stress, overall very nice. Complete, tight to staples (opens flat, no rust), good gloss, beautiful tan pages with sharp corners. Image of actual item shown. Bagged & boarded.